When the last of the fall garden's plants froze and expired, we dumped the contents of the container pots into some plastic bags. These bags sat through the long, cold winter, just waiting for the Spring. All those microbes (and some earthworms) munched away during this time on the organic materials remaining in the soil less mix. After purchasing some seedlings from the local "feed 'n seed", we were ready to refill the self-watering containers and plant. Ready for planting were some cabbages, collards, broccoli, and romaine lettuce. 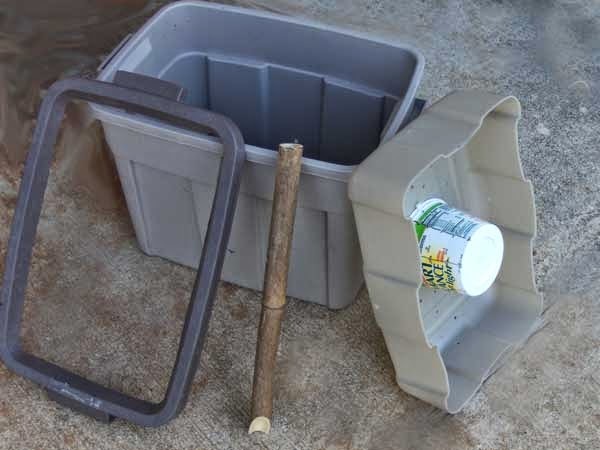 These added materials would replace what was lost when we pulled out the dead plants and roots. 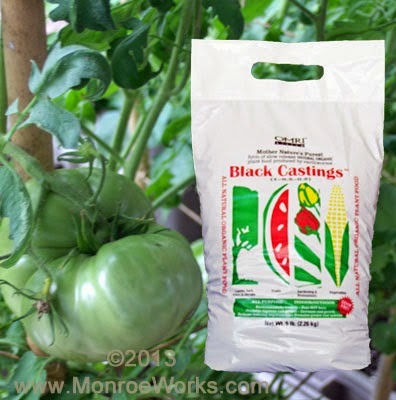 We added about 5 pounds of the Pure Black Castings® per 18 gallon container. We needed four containers for our seedlings. 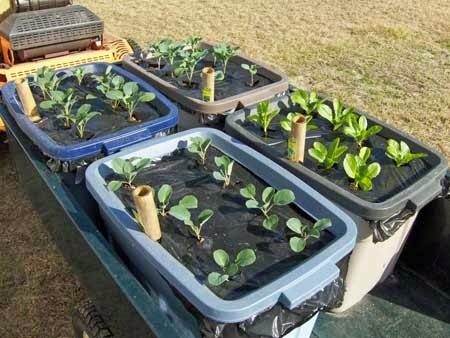 After filling the containers, we put our plastic "mulch" on the top and cut out holes for our plants. We planted the cabbages, collards, broccoli and romaine lettuce into the soil all the way up the stem to the leaves. 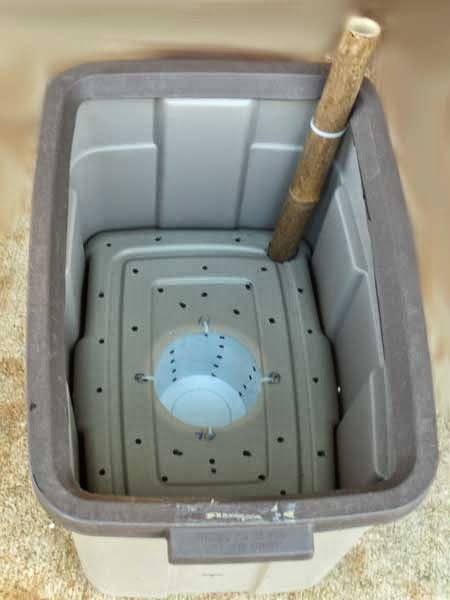 This extra depth produces extra root growth for a stronger plant. After planting, we filled the reservoir with water, adding 6 ounces of VermaPlex® to each pot as our only organic fertilizer. The romaines seemed a little pale at planting time, but after a few days, they greened-up considerably. Moving our self-watering containers to a new spot. Jack Frost is still hanging around (this has been the second coldest winter ever in these parts), so we will have to protect our little garden for a while longer. Last year, as I recall, we had a freeze around the 15th of April. We lost most of the spring garden we planted. This year, we're going to be proactive and expect the worst. 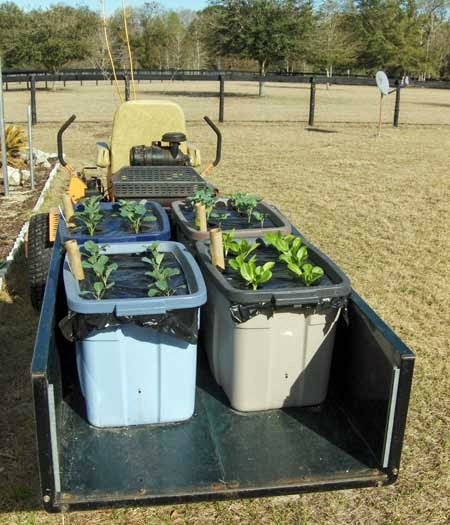 For now, our self-watering containers are in a little cart behind the Scagg. At night, we pull it under cover if frost is threatened. We can also put another empty container over the top for extra protection. During the day, we move it around to the sun. When things heat up (and I know they will), we can also move these cool weather vegetables into a little shade. Gives a whole new meaning to the term "truck farm". Watching all this mixing and planting has just worn me out. I'm heading back to that comforter - Bill's going to have to manage without me for a while. Pure Black Castings ™: Certified organic, OMRI listed 99.9% pure worm castings. VermaPlex ®: Liquid soil inoculant and foliar spray fertilizer made from our worm castings.